Thoroughly vacuum all carpet and use a crevice tool along the wall edges and on steps. We can provide this service for you, if requested. Pricing will vary for this service. Please hang full length draperies on coat hangers from the rods so they are not touching the floor. Please tuck up any bedspreads or skirting that touches the floor. During the initial walkthrough/inspection, please bring to the Specialist’s attention any spots or stains which may require special attention. 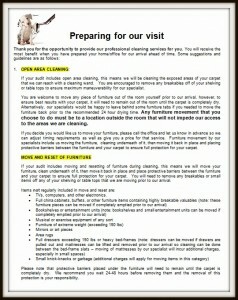 Please bring to our attention furniture or other items that may require special handling or care. We always respect your privacy and will not open doors that are closed in your home. If you would like the carpets in any room or in your closets cleaned, please be sure that the door is open. Please let your pets know that our Specialists do not bite. Please have pets put in an area so they will not bark, bite, run away, or be frightened by our equipment. We love kids, so please protect them. Our Specialists use hot equipment and cleaning products that can be dangerous to a child. Payment is required upon completion. We accept personal checks, cash, or any credit card. When you schedule you will receive a one-hour arrival time window. We make every effort to keep our appointments, however on occasion we may have to adjust our schedule. We will not rush through one job to arrive on time to the following job. By being prepared you can help us to maintain our schedule. If for some reason we have to adjust our schedule we will call to let you know. Please let us know ahead of time about any scheduling restrictions you may have on the day of your appointment. We are happy to give you a call prior to our arrival to let you know when we are on the way or if any delays. Please minimize traffic on the carpet and remember walking from a damp carpet onto a hard surface can be slippery. 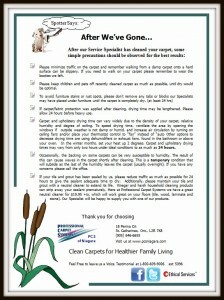 Please try to keep children and pets off recently cleaned carpet. 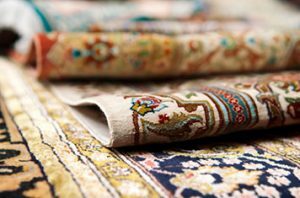 If carpet/fabric protection was applied after cleaning, drying time may be lengthened. Please allow 24 hours before heavy use. 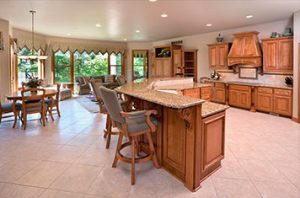 Carpet and upholstery drying time can vary widely due to the density of your carpet, relative humidity and degree of soiling. To speed drying time, ventilate the area by opening the windows if outside weather is not damp or humid, and increase air circulation by turning on ceiling fans and/or place your thermostat control to “fan” instead of “auto. Waves can be caused by humidty in the carpet shortly after cleaning. This is a temporary condition that will subside as the last of the humidity leaves the carpet (usually overnight). If you have any concerns please call the office. If your tile and grout has been sealed by us, please reduce traffic as much as possible for 24 hours to give the sealant adequate time to dry.